In October of 2008, my neighbor moved and was unable to take his dog with him. The dog was a pit bull, which meant that if he was surrendered to a shelter, he would most likely be put to sleep. I felt pity for this poor animal, who had spent most of its life tied to a tree unwanted by his human, so I agreed to take care of him myself until other arrangements could be made. This was a decision that would nearly cost me my life. Every day I went over to the neighbor’s house, putting down bowls of dog food and fresh water, and then leaving. I did this for days without any trouble. Then, one morning during a routine visit to the neighbor’s house, the dog attacked me from behind. Because I did not know enough about dogs to read the warning signs, his life and mine were forever changed. I will never forget that day. My life literally flashed before my eyes as I found myself on the ground in the jaws of this angry animal. He grabbed my ankle from behind and pulled me to the ground. Then he clenched my right leg between his teeth and would not let go. I knew he could easily overpower and kill me. I tried with all my might, but I could not loosen his grip. Panic set in, and I went into shock as I felt him ripping my leg apart. I was sure that I was going to die, or at least lose my leg. I knew it was going to take more strength than I had left to fight off the dog. So I cried out to God for help. I could feel the adrenalin pumping as I tried to kick him with my left leg. This just made him angrier, and he lunged for my throat. I caught him in midair by his collar, and he began to bite and chew my hand. Blood was pouring down my arm, but I knew that if I wrestled my hand out of his mouth, he would grab me by the throat and finish me off. Again I cried out to God for help. It was then that I heard a voice saying, “Throw him back with all your might and roll away.” I did exactly that. With strength I did not know I had, I threw the dog away from me and then rolled in the opposite direction and out of his reach. I jumped up, covered in blood and off ran to a neighbor’s house to get help. When the shock of the attack began wear off, I realized how I had fought back and escaped the dog’s grasp, somehow surviving the vicious attack in spite of the pain. It was truly a miracle. As I lay there in the hospital bed, with tears pouring down my cheek, my thoughts drifted to the dog that had injured me. I couldn’t help feeling sorry for him, knowing that he would pay the ultimate price. He would lose his life. I don’t blame the animal; instead, I blame the people who turned their dog into what he will remain in people’s memories: a dog that attacked a human being. Their neglect and isolation of the dog had resulted in his issues of fearfulness and territorial behavior. Chained to a tree, he had lived a very lonely life. I said a prayer that day thanking God for saving my life. I had 45 stitches in my leg and drainage tubes running in every direction. The bite had gone completely through, penetrating both sides of my leg and leaving the bone exposed. It was nearly two months before I could walk again. Over time my injuries would heal, but the attack left me with deep emotional scars. My love for dogs had turned into fear instead. Less than a year after my attack I met Susie. Susie was a little pit bull mix puppy that had been found beaten, burned and left to die in a park. Her story was heartbreaking. For two weeks this tiny puppy lay hidden, suffering alone without food or water. She had second and third degree burns over 60 percent of her body. 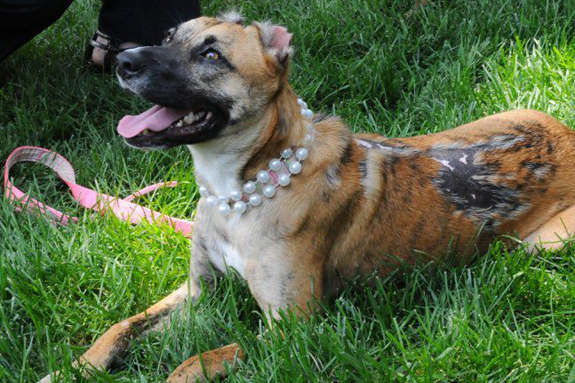 Her ears were burned to nubs, and scars ran all the way down her back. Her jaw was broken, and her teeth had been knocked out. A passerby in the park found her and called animal control. The poor puppy’s open wounds were infested with over 300 maggots, and they had to be removed one by one from her tortured skin. 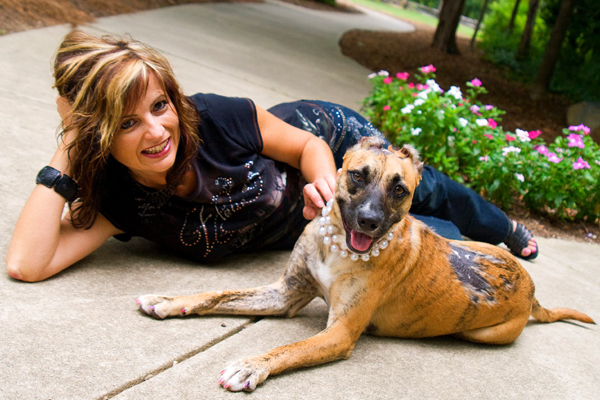 Susie was taken to the Guilford County Animal Shelter, and for weeks she endured daily treatments for her burns, initially needing to be anesthetized to survive the pain. 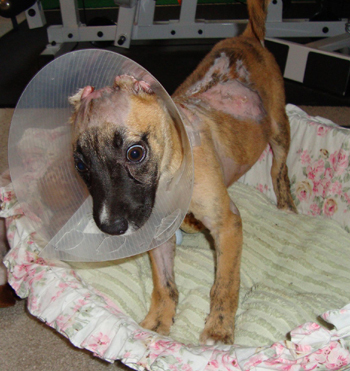 Susie was only 8 weeks old when her owner did this to her, all because she had licked his baby in the face. He said that he had gone into a rage, dragged her outside, beat her up and poured lighter fluid on her. Then he had set her on fire. For Susie, death seemed to be just around the corner, as she was severely dehydrated and malnourished. Susie survived. Another miracle! A friend of mine who volunteered at the shelter fostered Susie, helping with her recovery and nursing her back to health. I decided that I had to meet this precious puppy! When I did, it was love at first sight! As she was recovering, as often as I could I volunteered to watch Susie. Spending time with her was incredible. How could this little puppy trust and love people unconditionally after what people had done to her? If she could trust again, then so could I. My husband and I decided to adopt Susie. She would finally have the love for which she had so desperately longed. While Susie was healing from her injuries, the man that had hurt her was arrested. He would eventually go to trial for his crimes. Due to the current animal cruelty law in North Carolina, all he got was eight months of probation. Under North Carolina’s structured sentencing guidelines, there was no jail time for first time offenders. North Carolina citizens were outraged! I joined in with several friends to change this law. Something had to be done to protect the animals in our state. 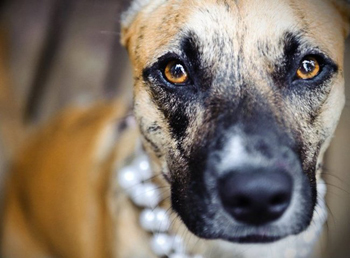 After months of rallying support, a stiffer new animal cruelty law was passed. 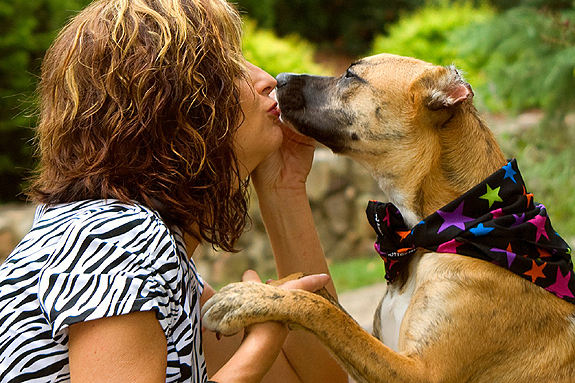 Reclassifying our current class I felony cruelty to animals statute, which carries no active jail time, to a class H felony allows the judges in North Carolina to impose an active sentence on people convicted of felony animal cruelty. This increases the penalties for animal cruelty to a maximum 10-month jail sentence. The current A-l misdemeanor charge for intentionally starving an animal in North Carolina was elevated as well to a class H felony. This law was named Susie’s Law! 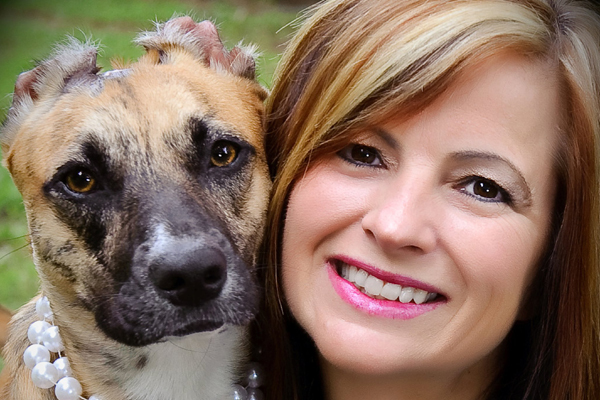 With the new law in place, Susie and I wanted to do something more to help animals as well as people. Susie is in training to become a therapy dog and hopes to visit with burn victims in hospitals, offering blessings to all those who have gone through what she has. I have written several books and also started a nonprofit organization called Susie’s Hope. We travel everywhere visiting special needs communities, pet adoption fairs, fundraisers, schools, churches and other organizations to educate people about animal cruelty and welfare. I believe that education is the best prevention when it comes to animal abuse. Children need to be taught to love and respect all of God’s creatures. You see, Susie and I shared something in common. She was wrongfully attacked by a human, and I was wrongfully attacked by a dog. We both were miracles. We overcame our fears and found each other. We turned a negative into a positive. Susie and I went from being victims to living a victorious life, and now we are inspiring others with the power of love, hope and forgiveness. 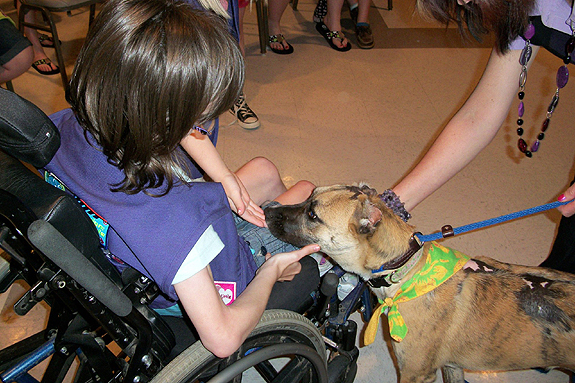 Most important, we want everyone to know that one person or even one dog can make a difference in this world. This article was originally published on October 31, 2011.